Hello everyone, I hope you are all having a great week despite this awful weather that has appeared today but only one day until the weekend, ahh! Onto todays post, so I decided to pop into WHSmith on my lunch break on tuesday as I noticed that a few magazines have got some great freebies available at the moment and some are collectable so I picked up both Cosmopolitan and Marie Claire on Tuesday and when I went back today they had a Glamour with the freebie I wanted so I quickly grabbed it off the shelf and headed to the tills so I wasn’t tempted! Anyway I thought I would show you guys what I got and to let you guys know what you can get your mits on if you wanted to and didn’t already know. Cosmopolitan – Elemis ‘Lovely Lips’ Lip Balm: I was super excited to see that Cosmopolitan were offering a range of Elemis products in this months magazine, so I sifted through all the magazines to see which one I would want to try the most and me being a lover of lip balms I instantly picked up the ‘Lovely Lips Lip Balm’. I have used it constantly since I got it and I love it! It leaves my lips feeling so nourished and has a gloss like effect to it whilst it slowly soaks into your lips! 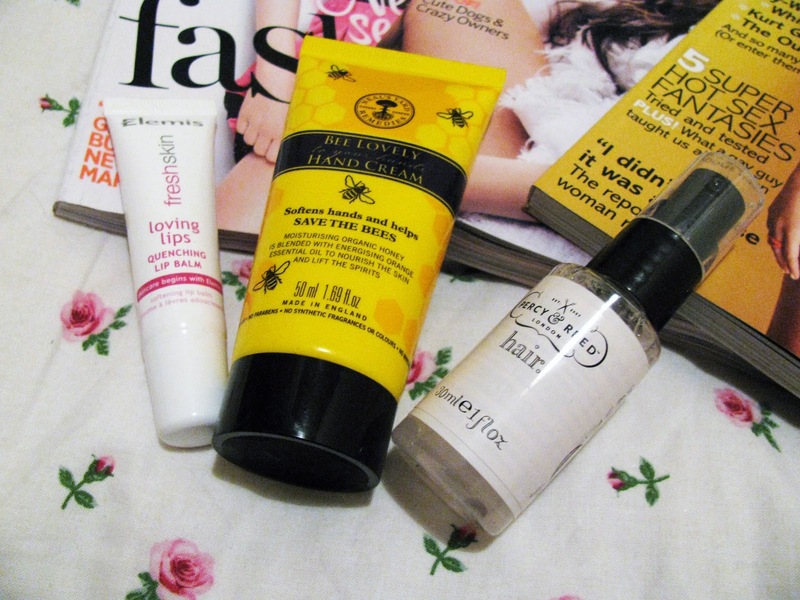 The other products up for grabs in this months mag are: Daily Moisturiser and Matifying Moisturiser. Marie Claire – Be Lovely Hand Cream: Now I have never heard of this brand but I love a good hand cream especially one that smells of bee honey and as this is a travel size one I thought it would be prefect to carry around with me. Again, I have been using this product since I picked it up in Marie Claire and it is amazing! It smells so nice with a mixture of honey/orange and it leaves my hands feeling so soft even with the smallest amount. As far as I know and could find out this is the only freebie up for grabs but it is still a really good freebie! Glamour – Percy & Reed ‘Volumising Oil’: I was looking through the freebies up for grabs in this months Glamour and I only really liked the sound of the hair oil as I’m looking for a good hair oil seeing as my hair is getting more and more damaged as each day passes. Anyway like I said above I saw one issue with the hair oil which I made a b-line for across the store, literally! Now I haven’t really had chance to use this but it is described as a no oil hair oil for fine hair which confuses me a little but never the less I’m really excited to try this out when I wash my hair later on tonight! The other products by Percy & Reed that are up for grabs are the Colour Shine Shampoo, Colour Shine Conditioner and Finishing Polish. Have any of you picked up any of these freebies yet? I hope you all have a lovely weekend. I’m not sure when I will be posting next as I’m travelling back home tomorrow to surprise my mum for mothers day which is one Sunday (just to remind any of you who have forgot) but shhh don’t tell her! Also I would love it if you could check out my friend Jess’s instagram page here. She is currently trying to set up her own custom clothing business and at the moment is selling custom tie dye and cropped t-shirts in a range of different colours and sizes at really low prices (pictured above). I will be posting a little more on some of her custom clothing soon, as the loyal friend I am of course I’m going to purchase a few things off her.